The Rangers Sports as covered so far dealt almost entirely with the post-war period from 1945. 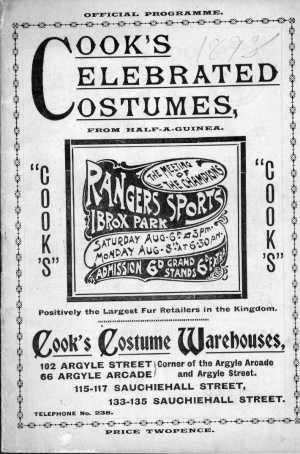 They were going for many years before that and the Rangers connection with athletics went right back to their inception. For example, before Clydesdale Harriers was founded, Tom Vallance set a Scottish long jump record and he was one of the first to join the new club when it appeared on the scene in May 1885. Then there were Clydesdale Harriers Sports held at Ibrox for many, many years before Rangers set up the Rangers Sports. When you read that a meeting was the 46th or 47th Rangers Sports, the number includes all the Clydesdale Harriers sports run there in the 19th and early 20th century. This page will look at the event during the 1930’s starting with the meeting on 2nd August 1930. “BRILLIANT PERFORMANCES AT IBROX PARK. “But if London did well, our own champion did better, for he succeeded in establishing a new Scottish native record for the mile. The race was run in heavy rain and a gusty wind, yet Riddell clocked 4:21 for the whole distance, or three-fifths of a second faster than the figures set up by J McGough at Celtic Park in 1906. His first quarter mile was covered in 59 seconds, the half mile in 2 minutes 6 2-5th seconds and three quarters mile in 3 minutes 13 seconds. Riddell ran from the 20 yards mark to win the handicap in time, which was announced as 4 minutes 19 2-5th seconds, obviously a mistake on the part of someone. There was, however, no doubt about his being within McGough’s time for of the six watches which times his full journey, four recorded 4:21 dead, one was a shade over while the sixth showed him a fifth faster. Other than the two stars mentioned above, the feature of the event was apparently the excellent showing put up by the athletes from Edinburgh and the Borders – one of whom beat London in the close finish above. Both the mile and half mile were won in fast times – the half mile, by J McWilliam of St Peter’s, in 1:54 off 46 yards. “The meeting at Ibrox Park on Saturday will hold its place among the long series held under the auspices of the Rangers Football Club for two reasons. 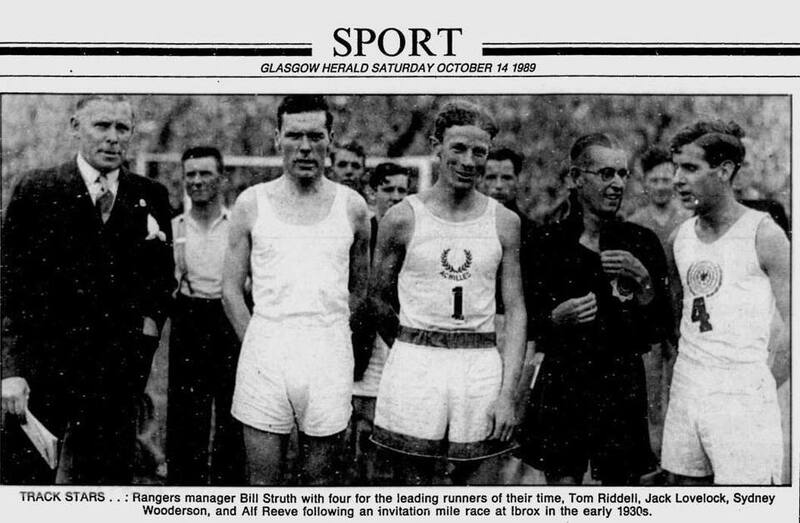 It was the medium by which Paavo Nurmi was introduced to the Scottish track for the first time, and during its course one new British and three new Scottish records were created. Even for a Rangers meeting this is exceptional, though the conditions were favourable to fast times and outstanding performances. The day was warm, without wind, and the track, one of the best in Britain, in excellent condition. It is not hard to suppose that our home standard would show a wonderful improvement if our climatic conditions were more stable and more kindly disposed towards athletics. The running of TM Riddell, JF Wood and AD Turner demonstrated this. The famous Finn took part in two races over two miles and over four miles. In both cases the handicaps had been framed to ensure that if he won he would come within sight or in world record figures. But this procedure on the part of the handicapper, while it may have been of good intent, robbed the races of much of their interest to the casual follower of athletics on the terracing. There was a certain fascination in watching Nurmi with his long loping stride reel off the laps with machine-like precision, but he was a lone figure running with his watch and separated from his followers by a large gap. Only once during his two races did he come within touch of his field, and that was when he had a duel with W Reavers, the old AAA Champion in the finishing straight of the Two Miles. That 80 yards dash to the tape must have caused more pulse beats than all that had gone before. Nurmi’s best appearance was in the longer distance race in which he succeeded in reducing Shrubb’s British record of 19 minutes 25 2-5th seconds by three seconds. He ran as he did in both races with amazing evenness. The first mile was covered in 4 minutes 45 4-5th seconds, the second in 4 minutes 55 1-5th seconds, the third in 4 minutes 55 seconds and the last in 4 minutes 44 2-5th seconds. There was the same evenness in the Two Miles, but here at the finish he was 24 seconds outside Shrubb’s 9 minutes 9 3-5th seconds, made on the same track in 1904. JF Wood who was off 200 yards in the Four Miles, maintained the interest in the first two miles of the race by keeping his advantage from the back marker intact. Wood actually ran the first mile faster than Nurmi, his time at this point being 4 minutes 38 seconds. At the end of the second mile he clocked the same time, 9 minutes 41 seconds, as the Finn. Thereafter the Heriot’s man tapered off a bit, but a sprint in the twelfth lap enabled him to clip two-fifths of a second off J McGough’s native record of 14 minutes 44 1-5th seconds. Although Wood had a bad time during the succeeding laps, he completed the full distance in the excellent time of 20 minutes 50 2-5th seconds. The report ran to 13 paragraphs and ten of them are repeated above. The rest of the meeting was covered in three short paragraphs where the other distance events were also reported to have been quite fast – 880 yards inside 1:54 the mile having the first two men finishing together and a little attention being paid to the 120 yards sprint and the high jump. It must have been quite a meeting – no mention of five-a-sides and a crowd of 45,000! The performances were of a good standard with the running of Robin Murdoch in the 120 yards special event getting most of the notice although WH Calderwood in the 1000 yards and the jumping of JF Michie were also noted. The reports on the 1000 yards, the three miles and the finish of the 17 mile road race are noted here. “It is questionable whether WH Calderwood has ever shown better track sense than he did in the 1000 yards. He was given the mark of 15 yards, a surprisingly large concession in view of his running over the same distance early last month, but even without it he would have proved the winner, for his finish , excellently timed, was so powerful that he left the others standing. His tome of 2 minutes 15 2-5th seconds was, under the conditions, splendid and it would have been interesting if he had run the full distance. The two scratch men in the race, Tom Riddell and Cyril Ellis disappointed. Ellis never at any time during the race appeared to be happy and the Scottish champion, although at the elbow of the leader at the bell, did not display much judgment. He covered the first quarter in 55 2-5th seconds, the half mile in 1:58 and seemed like getting there but weakened visibly a furlong from home and faded out. Not at any time did Walter Beavers appear likely to disturb Alfred Shrubb’s figures for three miles but although he was just beaten out of third place after a thrilling duel with Sam Tombe of Plebeian Harriers, he nevertheless ran quite a good race. His last half mile, although not timed, must have been very fast judging by the ground he made up, and one old ped, a world champion, was visibly impressed. The AAA champion’s time for the full distance was 14 minutes 43 4-5th seconds, and he covered the first mile in 4 minutes 51 3-5th seconds, and the second in 9 minutes 52 4-5th seconds. The names of the English regulars, London in the sprints, Ellis and Beavers in the distances, are becoming well known and it is a tribute to the organisers that they were able to entice AAA’s champions north of the border. They didn’t stop there – as the appearance of Nurmi shows, and in 1933 there was a team of Frenchmen competing. They were represented as a team in the medley relay and Calderwood ran the half mile stretch in race which Maryhill won. Calderwood was held by his opposite number but since one of the sprinters was absent, the visitors had to substitute a miler on the first of the 220 yard stages and that was their undoing. The same runner, R Lecuron, ran in the open mile handicap and, running wide all the way finished sixth, not far behind the winner. Another successful meeting despite the weather with many good performances and English and French athletes to spice up the competition for the spectators. 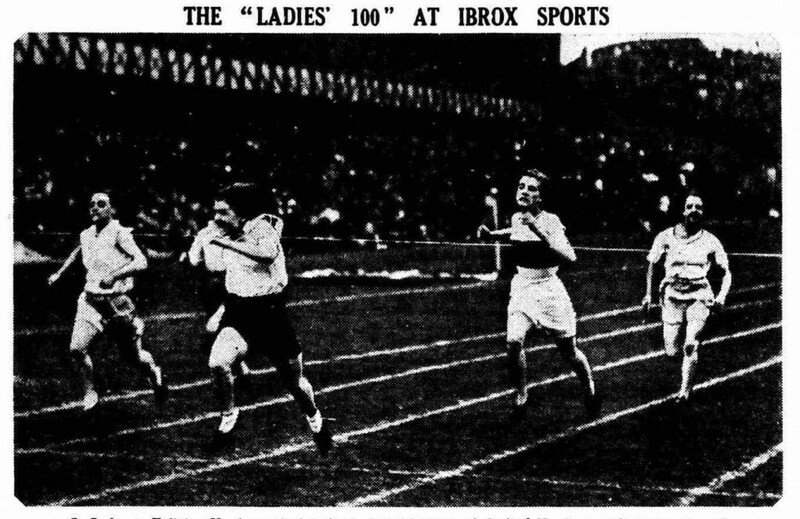 Ladies Athletics in Scotland really started about 1930 and The Rangers Sports were not slow to include any event that would create interest and possibly increase the gate money. The photograph above was sent by Gordon Bell and is of the Ladies 100 yards in 1932. The other Flying Finn: 1934 Rangers Sports. In the Olympics in Los Angeles in 1932, Lehtinen was the winner of a controversial win in the Olympic 5000 in Los Angeles. In the final Lehtinen and Virtanen led the race early on and they shook off all the other competitors except the American Ralph Hill. The race turned into a battle between Lehtinen and Hill with Lehtinen zig-zagging from one lane to another to another to keep the Ameican behnind. Despite an American protest, Lehtinen was the Olympic champion. Lehtinen was second in the Olympic 5000m in 1936. JE LOVELOCK A GREAT RUNNER. The actual report on the events started with what it called ‘an historic mile race’. “The mile race will go down in history, not only because of its record breaking incidents, but also because of the fact that four runners – Lovelock, Thomas, Riddell and Cyril Ellis – all started from the scratch mark. This was a unique occurrence at a Scottish meeting. It was also a sop to our national pride to find a Scottish champion moving in such fine company and by no means disgracing himself. Hugh Welsh has always been regarded as the finest miler that Scotland has produced, but after Riddell’s performance on Saturday the old Glasgow High School champion will have a sound claim to the honour. After ten years of track work, Riddell is undoubtedly running as well as ever and his rumoured retirement has now been indefinitely postponed. Lovelock is a real champion, and what is more, won this particular race without being fully extended. He moves with delightful freedom, and one can well believe after seeing him in action that sooner or later he will cover the mile in 4 minutes 5 seconds or even less. In Saturday’s race Thomas cut out the pace for the backmarkers for the first quarter, and then gave way to Riddell who led from the half mile until the finishing straight was reached. 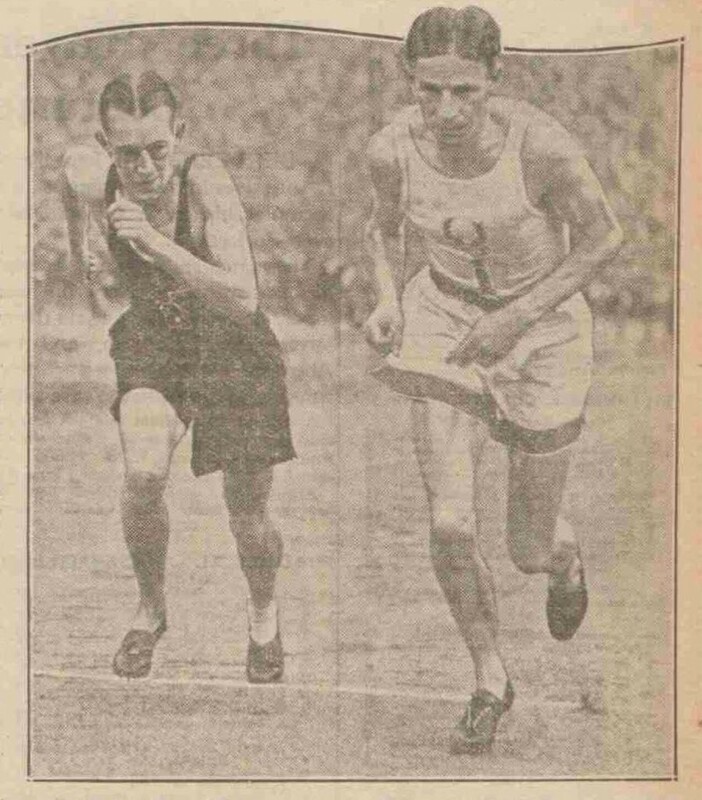 Then Thomas took command, but Lovelock, when he opened out, easily caught the champion, and passing him halfway down the straight ran out an easy winner by five yards in 4 minutes 13 3-5th seconds, the fastest mile ever seen in Scotland, being 3 2-5th seconds faster than the figures set up by Cyril Ellis in 1931. Thomas was timed as doing 4 minutes 14 1-5th seconds, and Riddell, three yards behind the Welshman, at 4 minutes 15 seconds, and with Lovelock out of the day, both would have been record smashers. As it is Riddell has made a new Scottish record, his time being three seconds faster than that set by himself two years ago. It is significant that in three attempts on the same track in the past four years, the Scottish champion has created new figures – first 4 minutes 21 seconds, then 4 minutes 18 seconds, and now 4 minutes 15 seconds, and this latest addition to the Scottish record book should prove a rare incentive to future runners. The Scottish records are slowly but surely coming into line with those of other countries, an indication that we are moving with the times. The lap times in Saturday’s race were: – 61 seconds, 62 4-5th seconds, 66 4-5th seconds and 63 seconds. Had Lovelock been pushed to win, we might have seen a new British record as well. He impressed as having a lot in reserve. These were by no means the only top men on display that afternoon – GT Saunders won the 120 yards special race and Ernest Harper won the road race from Dunky Wright and JF ‘Ginger’ Wood. It was Wood’s first run further than 10 miles and a notable performance. Donald Robertson also ran but, unusually for him, dropped out after 12 miles – not so surprising however when you realise it was his fourth big race in six weeks. Don Findlay, the British International hurdler, won the hurdles from Glasgow University student in a fast time. Fast times were a characteristic of the meeting in 1933 in all events from the sprints right through the card. The 100 was won in 9 3-5th seconds, the 220 in 21 4-5th seconds, the and the two mile races in 4 minutes 16 seconds and 4 minutes 12 4-5th seconds. In the steeplechase J Suttie of Edinburgh defeated T Evenson, the International cross-country winner from England. Jack Lovelock was a New Zealander who attended Oxford University from 1931 to 1934. He won gold at the 1934 London Empire Games in 1934 and then went even better when he won gold at the 1936 Olympics. He set world records for the 1500m (on 6th August 1936) and the Mile (15 July 1933). “The first visit of Lavri Lehtinen, the famous long-distance runner from Finland, to Scotland had been eagerly looked forward to. Running over his favourite distance of three miles, Lehtinen created a new Scottish all-comers record his time of 14 minutes 15 2-5th seconds being 11 4-5th seconds inside the figures set up by Alfred Shrubb on the same track 30 years ago. It is three years since Lehtinen’s great predecessor, Paavo Nurmi, visited Ibrox and there is a coincidence in that the experiences of the pair have been similar, each having broken a record, yet each being beaten on the handicap by a home runner. In Nurmi’s race it was JL Wood who put up a fine performance to win, and on Saturday another Edinburgh winner, W Hinde, ran a very plucky race to defeat the visitor. I remember when I started running in the 1950’s, and at the Commonwealth Games in 1970, Davie Brooke was a well known timekeeper and official. We all knew he had been a runner but didn’t realise how well he had run in such as the Edinburgh to Glasgow relay or that he had raced on the same track as Lehtinen. It is a lesson, if one were needed, that many of the officials at meetings were once better runners we were! I hadn’t heard the comment before either that Lehtinen was a more inspiring athlete to watch than Nurmi. There was also a 5-a-side football match in which the Rangers team of Meiklejohn, Brown, Venters, Smith and Gillick defeated the Celtic quintet of McDonald, McGonagle, Morrison, Buchan and Delaney 2 – 1. This may also have added to the size of the ‘gate’. Back to the star studded mile race. “Quite a large proportion of the crowd were no doubt attracted to Ibrox by the presence of Jack Lovelock, who more than any other runner at the moment, has completely captured the public fancy, a state of affairs due as much to his mastery of the Americans as to anything else. The mile race in which he took part dominated the meeting for another reason. He was meeting again on level terms SE Wooderson who defeated him in the AAA Championships last month, and a number of enthusiasts travelled up from the South for the purpose of witnessing the return duel. Wooderson defeated Lovelock again – and much more easily than at the White City – after a short sharp duel that lasted less than 100 yards. The pair ran together, with Lovelock leading, until the last 200 yards, when Wooderson came with a sprint and went in front. Entering the straight the Blackheath man led by about three yards, and although Lovelock got on terms, he was unable to hold the effort and eased up in face of Wooderson’s strong finish. Wooderson crossed the line in 4 minutes 12 7-10th seconds, 7-10th seconds faster than the Scottish all-comers record created by Lovelock two years ago. The New Zealander ran his first lap in 61 7-10th , the half mile in 2 minutes 7 1-10th and the three quarters in 3 minutes 11 8-10th seconds, his full time being 4 minutes 15 3-5th seconds. Although the races were of good quality with the usual quota of English champions such as Don Finlay in the hurdles, there was really no space after the coverage of the mile to do them justice at all. 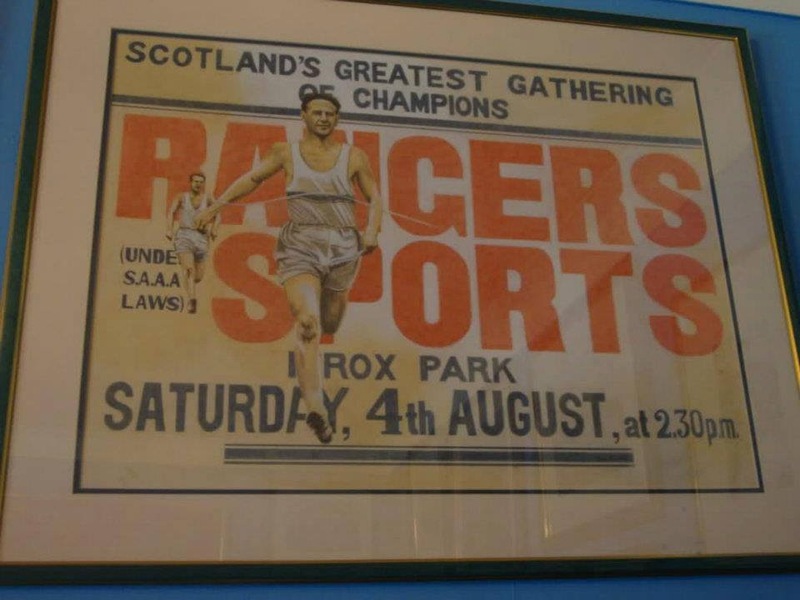 On 1st August 1936, athletics coverage was dominated by the opening of the Olympic Games which was probably the main reason for the lack of stars on show at the Rangers Sports. The Strathallan Meeting was always on the same day as the Ibrox meeting and it also had its usual full column but the coverage was not good. There were 20,000 spectators at the meeting where, as one of the headlines informed us, Rangers won the 5-a-side competition in which teams from Celtic, Hearts, Third Lanark, Clyde, Partick Thistle and Clyde took part. The Invitation Three Quarter Mile was won by the Alex Haire of the Royal Ulster Constabulary and Harry Haughie of Springburn won the Obstacle Race. But it was back to the usual standard in 1937 with some of the former crowd-pleasers in action again. 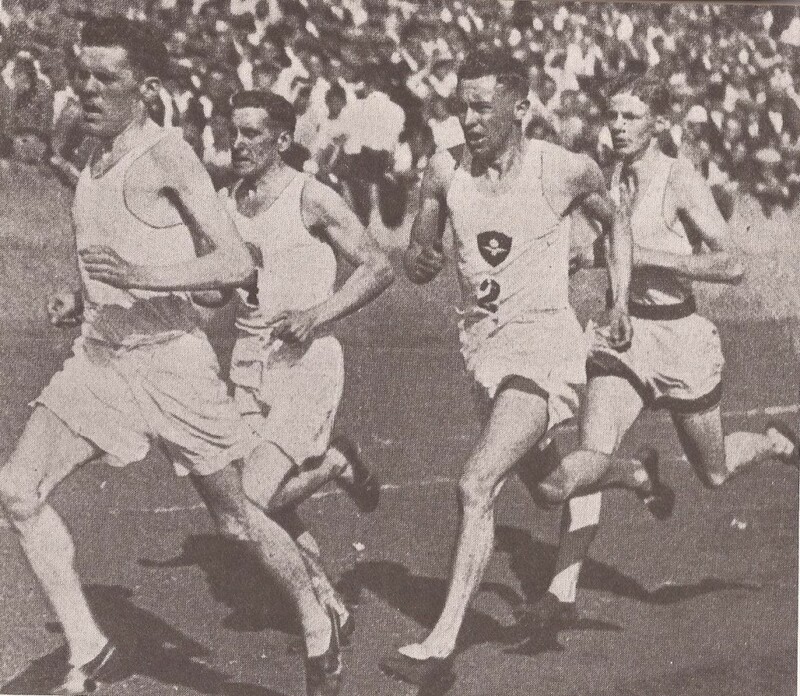 Overcoming the formidable handicap of boisterous conditions in a way that evoked general astonishment, Sydney Wooderson, the AAA’s one mile champion, established new British and Scottish all-comers three-quarter-mile records, and came within an ace of securing his first world record, before 40,000 people at Ibrox Park, Glasgow, on Saturday. Wooderson, who is 23 years old, is only 5 feet 6 1/2 inches in height and weighs less than 9 stone, but he made light of the handicap set him and beat RH Thomas by 36 yards in 3 minutes 9-10th seconds, which is only 3-10th slower than Jules Ladoumegue’s 1931 world record and surpassed the existing British record of 3 minutes 2 2-10th seconds set up in 1932 by JE Lovelock (New Zealand), the Olympic 1500 metre champion and record holder. Wooderson’s performance also eliminated the nine-year-old all-comers record made on the same track by R Watson the Olympic athlete whose time was 3 minutes 3 3-10th seconds. Authorities compute Wooderson’s performance as equal to a 4 minutes 5 seconds mile – a feat which has never been accomplished, and only in the light of recent progress has come to be considered possible. 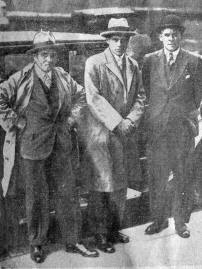 The story of the race, in which JC Stothard, who preferred to travel with the British team to Antwerp, was the only absentee, proved Wooderson to be under-handicapped. Quite apart from the wind which blew into the runners’ faces in the finishing straight, had there been someone in front of him to pull Wooderson out in the last lap, he assuredly would have whittled down those absurd ‘three-tenths’ that separated him from the world record. Jules Ladoumegue was second in the 1928 Olympic 1500m final after a hard race and went on to set world records at the Mile in October 1931 and 2000m in July 1931. Other news on the same day was that JC Stothard won the 800m in the international in Paris – it might have made a difference had he been available for Wooderson’s race. If you want to see how successful the 1938 Sports were, you really need to read the reports, such as the one in the ‘Glasgow Herald’ of August 8th. The crowd was 70,000 (seventy thousand spectators!) – described by the Herald as probably a record for an athletics meeting in Britain. The weather was very good for record breaking and there were top-class athletes across the board and the marathon from Gourock to Ibrox was the full 26 miles 385 yards and won by a South African from a Scotsman with Englishmen third and fourth and a Welshman fifth. Four Scottish all-comers records were broken – in the quarter mile, half mile, hurdles and pole vault. Indeed the pole vault record of 14′ 3″, set by American Cornelius Warmerdam was a British record as well. There was a big American contingent which gave what was termed an exhibition and reached distances in the shot and discus which would have been records had they been achieved in ‘proper competitive conditions’. Wooderson was attempting to break Lovelock’s 1500m record. “The crowd saw SC Wooderson, the world’s one mile record holder, fail by only 1.2 seconds in a gallant attempt to to lower the world’s figures for the 1500 metres set up by JE Lovelock in winning the Olympic title in Berlin two years ago. Incidentally it was the third fastest 1500 metres race that has been run. Run to sustained cheering, the race finished in a tumult of applause after Wooderson, last at the bell, overhauled all but one of a select field to finish 15 yards behind DB Pell, with AV Reeve, the only other Englishman, a close third. Pell’s time was 3 minutes 46.9 seconds and Wooderson was timed at 3 minutes 49 seconds – 1.2 seconds outside Lovelock’s record. Thus, although Wooderson had run relatively half a second faster than his world’s mile record, he failed in his attempt on what is, candidly, the most outstanding record in athletics history. The quarter mile was contested in the main by W Fritz who had been second in the Empire Games event and his conqueror W Roberts of Salford but this time Fritz won in a time of 48 seconds – an all-comers’ record. The hurdles had Glasgow born Don Finlay beating the American A Tolmich in the 120 yards special hurdles event in another all-comers’ record taking one tenth from the 11 year old record. AJ Collyer, the AAA champion took eight tenths from JC Stothart’s half mile time with 1 minute 52.8 seconds. Warmerdam’s pole vaulting was outstanding and his 14′ 3″ added one inch to the existing British record. TF Lalande, the South African who had joined Herne Hill Harriers, was almost lost in a maze of mile runners when he entered the stadium but after weaving his way through them, he won by almost a mile from T Strachan of Glasgow YMCA in 2:46:38. Cornelius Warmerdam was the first pole vaulter to clear 15 feet in the event which he did 43 times in his career. He always vaulted with the bamboo pole and his record only went when the metal pole began to be used. His record of 15′ 7 3-4th set in 1942 lasted until 1957. He was never able to compete in the Olympics because there were none in 1940 or 1944 because of the war and by 1948 he was professional coach and so unable to take part in the amateur event. It had been another wonderful meeting with a vast and enthusiastic crowd. “Maki, who set out to run three 4:40 miles, recorded 4:37 in the first mile, 4:48.8 in the second and 4:37.2 in the third to set up new figures of 14 min 3.4 sec – 4.6 seconds inside CAJ Emery’s month old British record and 12 seconds faster than the all-comers’ record set by his countryman LA Lehtinen, then world’s record holder, at Ibrox in 1934. Emery actually ran the last half mile faster than Maki yet was 4.6 seconds slower over the full distance. The big handicap field was of little assistance to the Finn. Schwartkopf, the American distance runner, dropped out in the seventh lap. At two miles Maki was 200 yards behind and at the bell he was almost 100 yards in the rear of the leader, M Bingham of Finchley Harriers (290 yards). Opening out over the last lap, Maki passed all but the Englishman who ran on strongly to finish 50 yards in front in 13:56.4. Wherever one looked on the field, there were excellent performances with the class athletes from abroad pulling the Scots behind them to some top class performances. The jumping of Steers and his countryman Batiste was the best in the high jump by far (6′ 4″ and 6′ 2″) although the pole vaulter George Varoff could only clear 12’6” when his usual performance was over 13″. The shot putter W Watson gave an exhibition in which he achieved 51’7 1/2″ – the best seen in Scotland that year. The biggest cheer of the meeting was for Donald Robertson who won the marathon from Gourock Pier in 2:40:02, beating the previous year’s winner and taking over 6 minutes from his time. Volmari Iso-Hollo was a Finnish steeplechaser who won two Olympic golds in the event. He won the 1932 Olympic steeplechase but was denied the record because the officials miscounted the laps, and then he won the 1936 event in a new world record of 9:03.8. He also won silver in the 10000m in Los Angeles, and then bronze in the 10000m in Berlin in 1936 to complete the ‘set’ of Olympic medals. The meeting was held in August and war broke out in September, 1939. There is of course a bias on this website in favour of endurance events while Rangers Sports embraced all events equally. The reports however dwelt on the longer races because the stars who were brought in almost every year included Olympians, European and Empire champions and record breakers were predominantly distance runners. It was an excellent meeting produced throughout the thirties and reintroduced in the forties and fifties.